After one day in Mu i Ne and relaxed in the Resort, the next day my family hired a Jeep and woke up at 4 hour for a journey to some very interesting places. The first destination we visited was Mui Ne Sand Dunes, also known as Sand Dunes Bay, which constantly changed its shape day by day, hour by hour. The most appropriate time to visit white sand dunes and Red sand dunes at about 5 am or 4 pm. It is time when you can go barefoot in the sand and not afraid of the burning sand while the sun screening. My family chose the early morning to see the Sunset on Sand Dunes. White sand dunes far from Mui Ne center about 40km, coming to the White sand dunes you can rent 4-wheel car running up the hills. 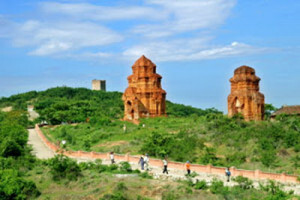 Along the coastal road, you can enjoy panoramic look at Mui Ne beach in the cool breeze, gorgeous white sand desert carpeted behind the skyline and many visitors mischievous romp. One of the interesting points in White Sand Dunes is the Lotus Lake with cool blue eyes, pink in the sun, wind and sand. The feeling of sitting on vast sand dunes watching the Lotus Lake far away we can feel more clearly than ever a great hand placement of Mother Nature. After the White Sand Dunes, another interesting place that visitors should not miss is the Red Sand Dunes. Distance between the White and the Red Sand Dunes is quite far, about 30 km. On one side is the sea, other is the Red Sand Dunes – all that endless immensity and people become little. On the Red Sand Dunes, you can rent sand skis at 50,000 vnd, sand sliding feeling was so different that I forgot all the anxiety and depression into the nature. After nearly 3 hours traveling between the two sand Dunes we had to keep going to the fishing village of Mui Ne. Here we saw and understood the workings of one pure sea fishing village- Original Vietnam. Mui Ne is the name of this according to the seafaring fishermen often come here to shelter when a storm or hurricane season arrives. “Mui” means a nose that is made. “Ne” means to dodge. It is the harmony between the warm sunshine and deep blue color of the sea will feel warm and fresh rates and attract a lot of visitors coming here. Go to Mui Ne fishing village early morning to feel the peaceful atmosphere, pristine, as the scent of the ocean mingles with gentle breath of wind, the green palm trees and the people here. Far far away from the image of a boat floating basket, the paddle displacement, boat fish are crowded into shore. The space here covered by the red sand and located not far from the beach. There are thousands of breast heaving sand pointing to the sky as the top of the tower. Sand with rain and wind has eroded so strange shapes, but hard as a rock. Finish the tour with four famous places in Mui Ne, the Jeep brought us to the hotel. Everyone was tired and sleepy because of getting up early but still happy and amazed about the trip.